In the current environment of constrained budgets, State, regional, and local transportation agencies are looking for more efficient ways to reach their transportation mobility and safety goals, objectives, and performance targets. Greater inclusion of TSMO strategies within the planning process results in a mix of improvements that facilitate progress toward targets while improving communities. Most transportation agencies realize they cannot build their way out of congestion, especially in densely populated urban areas. TSMO strategies help planners address reliability issues and improve upon reliability performance measures without increasing capacity. Construction and rehabilitation projects remain important for transportation planning, but planning for the effective operation of transportation facilities is critical to making good use of limited transportation resources.1 TSMO investments can complement capacity expansion or rehabilitation projects and, in some cases, provide more timely and less costly alternatives for achieving desired improvements in mobility and safety. Greater coordination and collaboration among planners and operators help span the differing planning horizons between them. Operators broaden their perspective to include a longer term vision for system performance and planners have a greater understanding of the shorter term planning needs for operations. This leads planners and operators to focus their attention on planning for TSMO investments that address both short-term and long-term needs more effectively. Integrating TSMO into the metropolitan and statewide transportation planning processes increases visibility of operational needs and TSMO strategies when investment decisions are made. A performance-based approach to transportation planning for operations requires focusing on mobility-oriented outcomes rather than on building and maintaining capacity—and this requires planners and operators to work together toward common objectives. The inter-jurisdictional and multimodal nature of TSMO requires collaboration and coordination among operating agencies across jurisdictions and between transportation and public safety agencies, private mobility service providers, and other entities in order to improve the security, safety, and reliability of the transportation system. Planners have often served as the conveners and facilitators for collaborative operations groups within a region and this can become an important avenue for integrating TSMO needs into the planning process. The connection between TSMO and planning is increasingly critical to prepare for connected and automated vehicles. Addressing these considerations as well as the advances in intelligent transportation systems (ITS) requires a holistic approach to mobility planning because this is anticipated to significantly change the transportation system. Additionally, travelers will have more mobility options, including shared mobility and non-motorized mobility. Transportation planners and operators are looking at transportation less in terms of lane miles of capacity and more in terms of services that enable mobility for people and goods. Figure 1 illustrates how planning for operations follows the same approach as the planning process and how TSMO can be integrated into the elements of planning. Functionally, this includes identifying reliability and operations issues along with other planning-related concerns early on and developing operations objectives and related performance measures during objective setting. 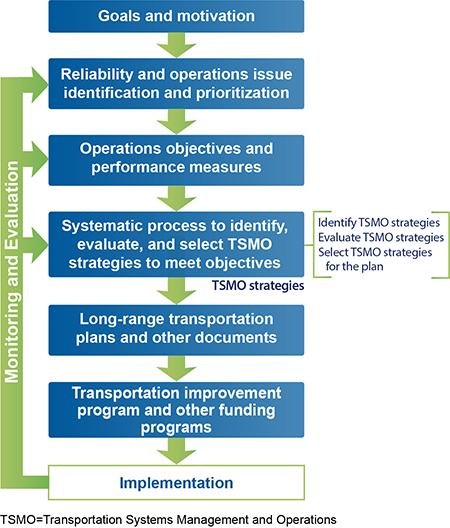 TSMO strategies can then be evaluated alongside other strategies and included in the transportation plan and program. This approach can also be performed for other planning and operations activities such as developing corridor plans and strategic TSMO plans. Figure 1. An approach to planning for operations that integrates operations in each major step of the planning process. Source: Adapted from FHWA, Advancing Metropolitan Planning for Operations: The Building Blocks of a Model Transportation Plan Incorporating Operations – A Desk Reference, 2010. Available at: https://ops.fhwa.dot.gov/publications/fhwahop10027/. Operators routinely collect data that can help identify needs (e.g., bottlenecks) and also recommend TSMO strategies that can address those needs (e.g., managed lanes, service patrols, real-time traveler information, incident response teams, transportation management centers). Planners and operators can develop common goals and objectives and related performance measures for mobility within a region or State. For example, growing emphasis on system reliability suggests that planners consider including reliability-oriented objectives and performance measures for travelers and goods movement in their transportation plans. Operators typically have the data and technology infrastructure needed to support the development of these objectives and measures and to monitor system reliability performance. States and MPOs can connect outcome-related objectives to more specific objectives that drive State, metropolitan, corridor, and subarea planning and operations. With the greater emphasis on travel time reliability, States and MPOs can identify unreliable roadway segments and the TSMO strategies to be included in long-range plans, short-term corridor plans, and Transportation Improvement Programs/ State Transportation Improvement Programs that will address those segments. Working together, planners and operators can create innovative institutional arrangements that share resources, provide mutual assistance, agree on interoperability standards, and share real-time and archived data. The discussions and analysis required by the Congestion Management Process offer an opportunity to include a wider variety of operators and planners in discussions about non-recurring congestion and travel time reliability.